A season that started with Super Bowl aspirations has devolved into one of dysfunction and disappointment for the Chicago Bears football team. The team hasn’t performed up to expectations, coaches and players seem to be at odds with each other, and an incident last week involving one of the Bears coaches brought everything to a head. 1. Talk behind people’s backs—Speaking negatively about someone to another person shows tremendous disrespect to the person you’re speaking about and a lack of integrity on your part. It not only erodes trust with the person you’re talking about, it causes distrust with the person to whom you’re speaking—“I wonder what he says about me when I’m not around?” The old adage “if you don’t have something nice to say then don’t say anything at all” is a good one to abide by. Even better, if you have something critical to say about someone, say it to that person. Muster up the courage to have those difficult conversations with the person involved and you’ll probably feel less frustrated and inclined to vent to other people. 2. Call team members out in public—Some leaders think by calling someone out in public it will motivate that person to perform better. It might work for a short while, but it only leads to resentment and bitterness and eventually performance will decline. No one wants to work for a leader who is willing to embarrass them in public. Team members want leaders who support them, encourage them, and have their back when times get tough. That doesn’t mean ignoring poor performance, coddling people, or not holding them accountable to high standards. It means leading them—setting goals, teaching, training, coaching, evaluating—not belittling and criticizing people. Remember, it’s better to reprimand in private and praise in public. 3. Don’t hold people accountable—It erodes the trust of good performing team members when they see their leader not holding poor performers accountable. In the case of the Bears, head coach Marc Trestman has repeatedly said Kromer’s behavior is being addressed and “handled internally.” Only those in the Bears organization know what that involves, but it’s important that team members see accountability being lived out within the life and culture of the team. The bottom-line is that holding team members accountable—in respectful, dignified, and equitable ways—is critical to maintaining high levels of trust within the team. Without accountability, team members feel as if “anything goes” and leads them to question who’s really in charge. 4. Fail to communicate openly—One of the most important truths I’ve learned in my leadership career is people deserve candid, yet caring feedback about their performance. Frequent, open, and trusted communication between the leader and team member is imperative to building and sustaining trust. If you are willing to communicate openly with a team member about something as important and personal as his/her performance, that person knows they can trust you to communicate openly and honestly about other areas of your leadership. Communication is a primary vehicle of transmitting trust. Openly and willingly sharing information about yourself, the organization, and the work of the team are all important ways to build trust. 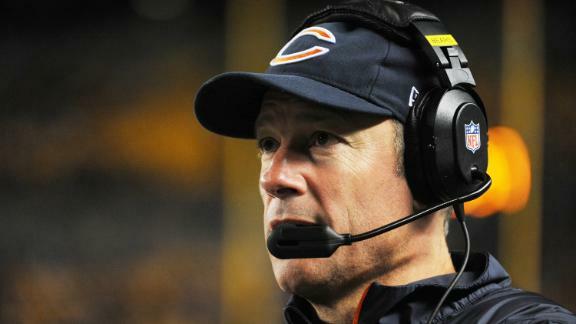 Coach Kromer did the right thing by apologizing for his behavior. He recognized what he did was wrong and he addressed it with the people involved. Head Coach Marc Trestman seems to be trying to navigate this situation appropriately, a challenge in and of itself considering he’s operating under the spotlight of constant media attention. These events provide a lesson for all of us leaders about how easy it is to erode trust with team members through thoughtless words and careless actions. In a typical situation, these observations and recommendations are sound. But in this context, they are oblivious to the reality of the situation. Jay Cutler is a disgrace, a franchise player getting paid way more than he deserves or has earned, and we don’t see the organization holding him accountable. Maybe Kromer made a mistake by stepping outside the chain of command, but you know what? He was probably just really, really frustrated. And you know something else? He didn’t needto tell Cutler to shape up or express his concerns in private. Anyone with a working brain knows how pitifully Cutler has been performing, as a player, QB, leader, franchise player, you name it. Why are we reprimanding Kroner for simply publicly expressing something everyone in that building is probably already thinking? Misplaced energy. I love your passion Sally! You must be a die-hard Bears fan. I happen to agree with you that Cuter is overrated and not a good leader, however, that doesn’t excuse Kromer’s error in judgment. I’m not reprimanding him, just trying to distill some lessons from the situation.